Marty P. Marten, 70, passed away on Dec. 25, 2018, in Augusta, Kan. He was born on Dec. 29, 1947, in Cedar Vale, Kan., to Wilbur and Clara (Harget) Marten. Marty loved and lived the cowboy life. Growing up, Marty worked summers in the High Sierras and worked on cattle ranches in the Flint Hills and the Osage Hills. Marty rode horseback in much of Colorado's back country. Marty attended Kansas State University before transferring to Colorado State University and making Colorado his home. Marty was an author, trainer, teacher and mentor. 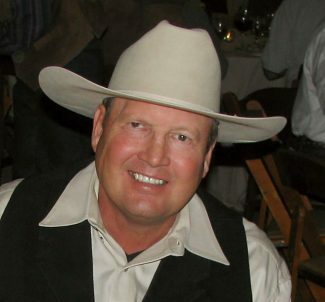 A student of Tom Dorrance, Ray Hunt and Buck Brannaman, Marty trained countless horses and riders. Through his hugely popular books, clinics, demonstrations, speaking engagements and successful trailer loadings, he made the world of practical horsemanship available to many who would not otherwise have had the chance to experience it. His contributions of expertise, time, experience and patience have changed the lives of horses, horsemen and horsewomen throughout the West. Marty authored two books, PROBLEM-SOLVING – Preventing and Solving Common Horse Problems, Volume 1 and Volume 2, published by Western Horseman Magazine. Marty also authored numerous articles. Marty devoted his life to helping people and horses get to a better place. Marty made a huge impact on the lives of so many. Marty was a true friend and an inspiration to all. Marty battled multiple health issues for the last 15 years of his life, but he never lost hope because of his deep and abiding faith. His life was a constant witness to his love of God. He was a member of St. Stephen's Episcopal Church in Longmont, Colo. He was preceded in death by his parents, Wilbur and Clara Marten and his sister, Marilyn Skaer. Marty's father was one of 12 children and the Marten family history is long and full. Marty is survived by his nephews, Brady (Krissy) Skaer, Justin (Joli) Skaer of Kansas and Marty (Julie) Skaer of Oklahoma and his 10 grand-nieces and grand-nephews, Colton, Libbi, Anna, Heidi, Joe, Kora, Chisum, Gracie, Sam and Jeremiah. Funeral services were held on Dec. 29, 2018, in Augusta, Kan. A Memorial Gathering and Service to honor Marty will take place on Feb. 17, 2019, at the Colorado Therapeutic Riding Center. Memorial donations may be made to CTRC, 11968 Mineral Rd., Longmont, CO 80504.